THE VICTOR is a chemical free treatment for Varroa mites. It heats the brood area to 42 degrees Centigrade (107F), which kills 85% of the mites on adult bees and in the capped brood while not harming the bees with one 2.5 hour treatment. You can treat a second time 12 days later, to kill another 85% of the remaining mites for a total of 95%+. 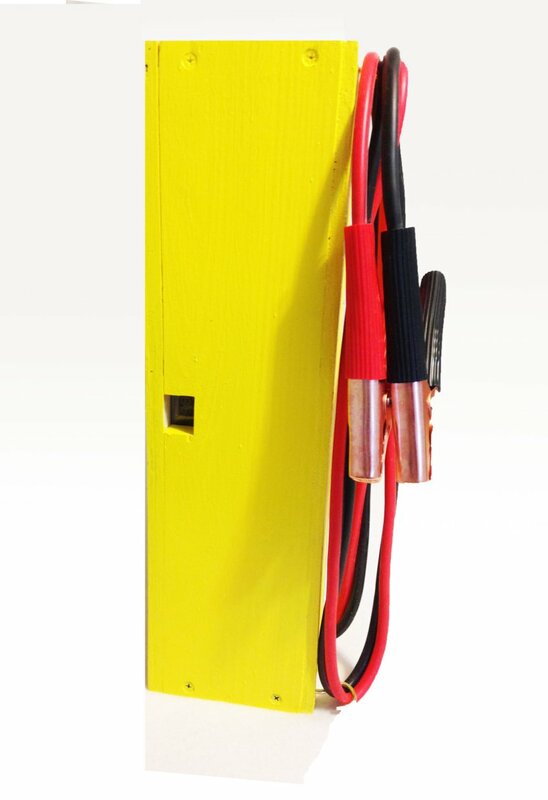 To use the Victor, you remove the top and inner cover, move the brood super to top, place The Victor on the brood super, and connect a 12v 55Ah battery to its leads. The heater will start to heat, the fans will blow, and the thermostat will show the current temperature and the target temperature in centigrade A red dot near the temperature indicates the heater is on. When the temperature at the top of the hive reaches 45C(116F), the entire brood area will be 42C (107F) and the treatment has begun. The thermostat will maintain the temp for 3 hours then automatically shutoff> Deadly heat for Varroa, but not for bees. You will need a 12v 55Ah or larger deep cycle battery like they use in a bass boat, wheel chair, or golf cart, RV, or solar storage fully charged to do one treatment. The Victor works in the shade, on cloudy days, and can be moved from one hive to the next after recharging the battery. The Victor is the answer for people that do not want to use chemicals to treat for Varroa mites. Two good times to treat would be 2 weeks before you put on the honey supers in the spring and right after you remove the honey in late summer. But, since it is only warm air you can treat anytime. We include a 2 year warrantee and a 30 day satisfaction guarantee. If you are not satisfied we will refund your purchase price on receipt of your unit. Best way to verify the effectiveness of The Victor is to do a mite drop count on the mite count board for 24 hours before the treatment, and a 24 hour mite drop count that includes the treatment. You should see 3 to 5 times as many mites on the count board the day of the treatment as you saw the day before. Those are the phoretic mites. Over the next 12 days you will see mites fall as the brood they were capped with hatch and clean out the mites that died in their cell! The Victor has a 2 year warranty.